What is Best for Web Development — Wordpress Website vs. Custom Website? Do you want to build your own website to stay ahead in this competitive marketplace? Well, we all are quite aware of the intricacies of launching a website for advancing a small business. Before introducing, it is exceedingly important to identify the oblige platform that can accomplish all your business needs. At present, the robust content management systems like WordPress and HTML both are giving stiff competition to each other. It creates confusion among the business owners to pick up the right CMS for creating an attractive and ingenious website to reach maximum customers. Undoubtedly, WordPress and HT have various advantages that can amplify all your business needs in a minimal timeframe. 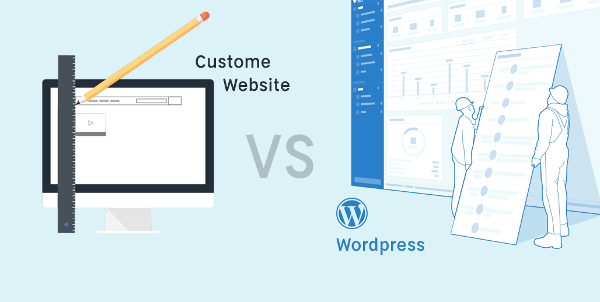 Today, we are going to shed some light on a simple comparison that can guide you to make the right decision in deciding CMS. In a simple term, WordPress is a website creation tool — an online open source CMS that comes cost-effectively. WordPress is completely free, and it's easily accessible for all the non-technical users. Experts believe that it is a simplified version of HTML. On the other hand, WordPress also allows the integration of different type of content like traditional mailing lists and forums, online stores, and media galleries. Initially, WordPress was launched as a blogging platform, but gradually it starts offering various templates, plugins, and themes. WordPress is an open source process that allows you to improve or modify its source code that means you can easily customize your websites according to your needs. Users can easily customize their websites' look or functionality. WordPress allows users to upload their desired images, video, audio, and other media. If you don't have a premium version of WordPress, do not worry, there are hundreds of free themes and plugins available you can easily download for your website. WordPress manages regular updates and website security patches that maintain a secure environment for the user. One of the key benefits is traditional and updated browsers, support HTML. HTML is an easily understandable and preferable language for all the developers. HTML is an SEO friendly language it gives maximum flexibility with minimum complications. A site written on HTML doesn't need regular backups. As compared to other CMS, HTML gives a significant speed advantage to the users. With the support of lesser resources HTML based websites can work on a slower server. How to take the right decision between WordPress or HTML? WordPress is a cost-effective option for adding content for any business. However, HTML is a one-stop solution for easily publishing an interactive web portal. It also gives value to your many that you spent to create a webpage in HTML. You can enjoy numerous options, flexible and customization on your website. On the other hand, WordPress makes the whole process quick, easy, and profitable. It gives you the freedom to enjoy free service, but you will miss advanced features that only HTML offers. WordPress is an ideal solution for small and mid-size businesses. HTML is developer-friendly language so a non-technical user can’t utilize the platform of HTML. Mostly, enterprises pick this option to build their own portals. WordPress also offers a set of plugins that allow users to explore the more advanced functionality of their site. With static HTML, you have to deal with validation and the data that a user submits. With WordPress, a user needs to install just a plugin. Wordpress is more secure than HTML. Actually, it depends on how you use or maintain. But still, WordPress has some risk of security issues due to the database connection as sometimes it becomes prone to hackers. For sure, security is depending on your usage. A security risk still there if you don’t update every plugin you install in WordPress, whereas HTML website holders no need to worry about this. Hopefully, our article helped you get better knowledge about these two website creating platforms. Undoubtedly, both platforms are working tremendously in their own way. Before investing thousands of dollars to build an ineffective website in HTML, you should explore the advantages of WordPress. Who knows, this content management system tool may meet all your requirements and reduce your need to go with HTML. Ritesh Patil is the co-founder of Mobisoft Infotech that helps startups and enterprises in mobile technology. He loves technology, especially mobile technology. 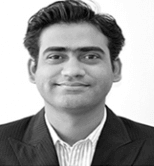 Ritesh’s an avid blogger and writes on a mobile application. He works in a leading android development company with skilled android app developers that have developed innovative mobile applications across various fields such as Finance, Insurance, Health, Entertainment, Productivity, Social Causes, Education and many more, and has bagged numerous awards for the same.